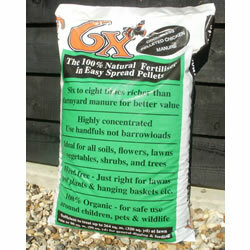 Very easy to apply - for vegetables, fruit, flowers, shrubs, lawns, pot plants and hanging baskets. 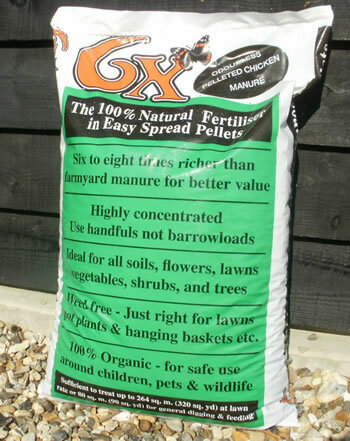 Easy-to-apply, dry-pelleted, organic chicken manure - excellent fertiliser for all vegetables, soft fruit, flowers, lawns, pot plants, hanging baskets and window boxes. Feeds the soil, not the plant. Simply sprinkle on the soil as directed, work in with a fork, and water well. Each bag contains 20kg, and will treat around 70 sq. m. of ground. 100% organic, weed and bug free and with virtually no smell. Roughly 6-8 times more concentrated than traditional farmyard manure, and with all the trace elements so essential for healthy, productive plants. Safe for all garden life, and encourages the earthworm population, too.